On Earth-2, the crystal shard has been activated. The Batmen and Supermen are then fired upon by Slade and his men who are taken out by Earth-2 Superman and Batman. Trying to get their New Earth counterparts to step aside, the Earth-2 doppelgängers attack and startle the younger heroes, until Batman and Superman coordinate their efforts to attack their older-selves. 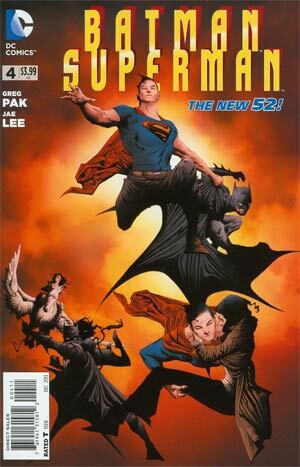 Superman grabs the shard and his wishes become reality as Earth-2 and New Earth begin to combine as worlds collide and the dead (as in the Kents) begin to rise. When Batman tries to stop Superman, he himself begins to transform into a dark bat-like figure. Clark stops touching the crystal and walks away. Slade, getting back into his cannon, shoots at Earth-2 Superman and misses, sending his blast directly toward the Batwing piloted by Lois Kent and Selina Wayne/Catwoman. With Earth-2 Superman in space fighting against Slade's beam, Batman sends Superman after the declining Batplane. Superman, not yet being able to fly, can't change the trajectory. Batman however gets Superman to fly by reminding him of who he really is. Superman then flies the Batplane, and it's passengers, to safety as his Earth-2 self sends the energy beam back towards Earth, destroying the canon and the crystal. On the ground, Earth-2 Wonder Woman is facing the Trickster who decides that Earth-2 isn't ready for Darkseid's arrival, but that New Earth will live because of Superman and Batman's power. Then the Trickster sends everyone back and erases their memories of the previous events. Back in Gotham, Clark Kent returns a day after meeting Bruce Wayne about the malfunctioning WayneTech bots. The kid who Clark "saved" the day before, Zack, fights back against his bullies as Bruce and Clark watch. After Clark and Bruce part ways, the Trickster reveals herself as the "devil" on Zack's shoulder. Story - 4: Batman/Superman is a book that I look forward to every month. I really enjoyed the first two issues, issue three was also good, and last month's "Villain's Month" issue (Doomsday!) was great! This issue was an over-all solid conclusion to this first arc of Batman/Superman and makes me more excited for the next issue (along with the upcoming Annual). That being said, this issue was interesting because the New (52) Earth Batman and Superman both overcome their Earth-2 counterparts, and even though I was actually more invested in the Earth-2 versions of the characters I was proud of the mainstream versions as they showed that they were worthy to defeat Darkseid, and really this arc here explains WHY the Justice League wins against Darkseid as opposed to the proto-Justice Society of Earth-2. Interesting stuff. I also loved that Superman, who at this point in his life can only "leap," overcomes his boundaries and actually flies. And the part about this that really gets me and really makes me happy is that it was Batman who got him to fly, but Lois Lane who caused him to fly. That is very powerful to me because Batman IS Superman's best friend (and vice-versa) and Lois Lane IS the love of Superman's life (and vice-versa). The fact that two of the most important (I'd also include the Kents, Jor-El and Lara, Jimmy Olsen, Perry White, and Lana Lang) people in his life were what/who gave Superman the strength to overcome his physical boundaries really excites me and is something that I just fall in love with in a story. That being said, I know Batman and Superman weren't best friends at the time, but one day they will be. I also know that Lois and Superman are not yet together, and maybe won't for a good while, but I believe they will be. Lastly, Batman/Superman has a lot of potential. I've mentioned before how much I respect Greg Pak as a writer, from Incredible Hulk to Iron Man to Magneto to now that he's writing on Batman/Superman and his upcoming Action Comics. I mentioned this in my review of Justice League #23.1 (Darkseid #1, which I reviewed early on last month)! I think Pak will do a great job on this book and I really do look forward to the next arc of Batman/Superman, my two favorite superheroes together again. Art - 3: The art in this book was not bad by any means; however Jae Lee's art is always a little convoluted. Ben Oliver's artwork on the last few pages was better and more enjoyable. That being said, I wonder if Lee can't actually finish a book and that's why Oliver keeps doing the extra pages? Cover Art - 3: It looks cool. Superman is proximately in the center, Batman is off to the side and then we have the Earth-2 couples of Batman and Catwoman and Superman and Lois Lane along with... Earth-2 Wonder Woman?... Really? Wonder Woman is on the cover to a book called BATMAN/SUPERMAN?!?! If Batman was on the cover to a Superman/Wonder Woman book I would complain, so clearly this is an issue for me. Stupid? Maybe, but that doesn't change how I feel about this cover. Cover Art (Variant) - 5: Tony S. Daniel's artwork is amazing and I love him for it. His work on Detective Comics, Action Comics, Justice League, and now Superman/Wonder Woman makes me happy that he is in the comics business! That being said, his cover easily gets a 5/5 from me because it displays both the regular New 52 and Earth-2 versions of Superman and Batman in the center of the cover. And quite honestly, it just looks so dang cool!